Indian cuisine is a medley of sophisticated aroma and subtle flavor comprising of spices,herbs, vegetables, legumes and rice. There exists regional dishes and cooking styles. Each region has a main ingredient. I hail from Southern part of India where most dishes comprise of rice as a major ingredient in contrast to the North, where they prefer wheat(Chapati, Roti). Pickles and chutneys are quite famous throughout India. Unlike in US or UK, pickles in India are the sun-dried vegetables marinated in salt, oil and spice powder. They could be stored for months together and its preparation process is a major family event. Some do have family recipes for it which has been carried from one generation to another. Many of my non-Indian friends love spicy Indian food. I had been to a restaurant with my labmates once. There is an Indian restaurant near my lab. We were five of us, each one of us from each part of the world. To my surprise, everyone loved the food (samosa with channa masala, paneer wrap, dhal, naan) and I went bit curious to know whether they would go to an Indian restaurant again. The reply was they started eating Indian food long time back and that they love its flavour and taste. Our conversation landed on the complexity of Indian cooking and everyone finds it difficult to whip it in their kitchen. There is a strong belief that Indian cooking is time-consuming and complex. I am here to disprove it. Here is my easy ways to make exotic Indian food at home. Easy Indian cooking is a celebration of the food Indians cook in non-Indian kitchen, using ingredients available in most local grocery stores. Before we start with the actual cooking, lets have a quick peep in to the pantry. 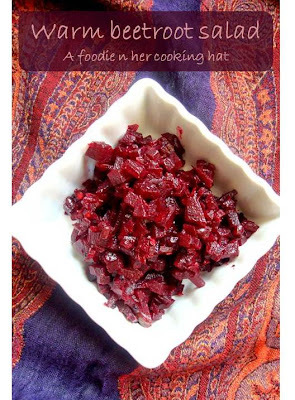 I would like to start with a simple recipe: Warm Beetroot Salad. Most of the incredible vegetable stir-fried dishes follow a similar protocol. Spices like mustard, urad dhal, dry red chillies or cummin are added to the heated oil in a kadai and are made to splutter. This tempers the oil and then its followed by the addition of green chilles or curry leaves. These ingredients coat the vegetables with a wonderful flavour. Almost every Indian dish is made tasty by the addition of turmeric powder ( an antiseptic) and chilli powder. 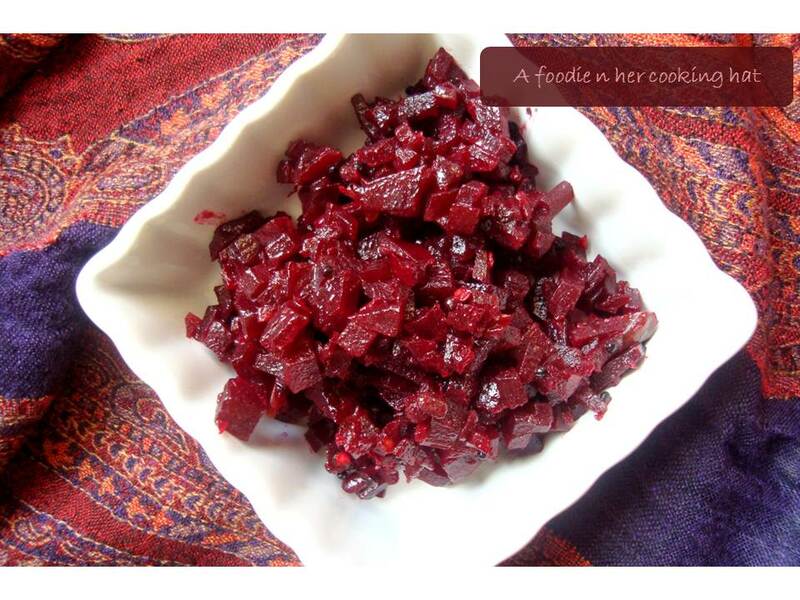 The beetroot curry is a very simple dish made by using little oil, mustard seeds, urad dhal, curry leaves, green chillies, turmeric powder and onions. The sweetness from beets and onions blended wonderfully with green chillies and unfolds a delicious taste out of it. This curry is made in every household atleast once a month. They are nutritious and healthy. They taste absolutely delightful with roti, naan, chapati, rice/ yogurt. Heat the oil in a kadai. One they get heated up, throw in the mustard seeds and let it splutter. Then add the urad dhal and let it cook for a min. Now add the curry leaves and serano pepper/green chillies. Mix in the onions and little salt and let it sweat. Add a dash of turmeric powder and cook till the raw smell disappears. Add the chopped beetroot and give it a complete mix. Pour in the water and cook covered on medium flame for 20-30min. Cook until they turn soft. If needed add another 200ml water and cook for further 15min. Serving tip: Serve hot with rice/chappati/roti. You can also serve them as wraps with lettuce, ketchup and mayo. Very new to me….looks yum…. Simple and delicious curry… Lovely clicks!! What colour dear! great way to introduce Indian cooking. Such a delicious curry…such a long pandry list, definitely very useful for beginners..
Nice list of ingredients,newly married will be happy to see this list. Simple one. Looks nice and yummy. Healthy and colorful, this looks so delicious!